Divers Lodge Lembeh is not just about diving... There is a lot to discover around the lodge! 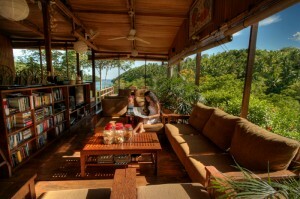 Divers Lodge Lembeh, founded in 2002 is a happy sister resort of Magic Bay Rao and Weda Resort. Divers Lodge Lembeh is very proud that we can make your diver’s dream come true, within all budgets. 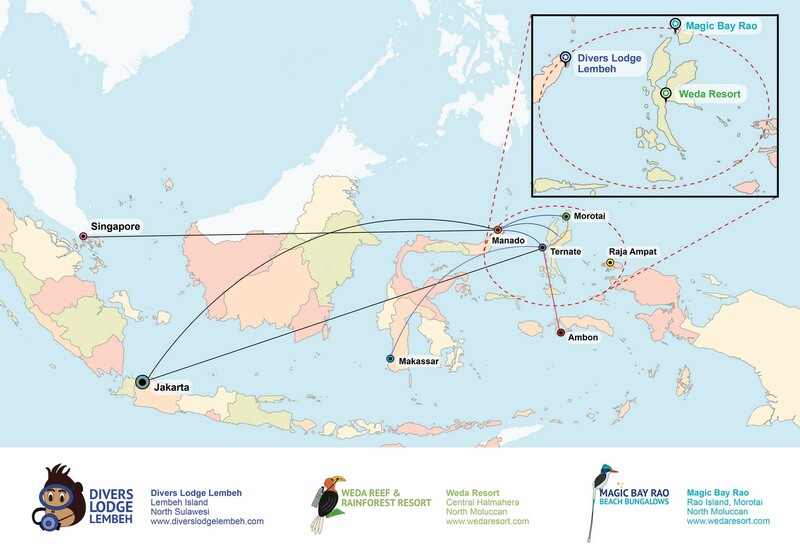 And by staying with us you directly contribute to our conservation and education projects. Our lodge is situated on the most beautiful part of Lembeh Island in the Lembeh Strait, surrounded by protected rainforest. Our experienced guides are happy to show you the most amazing critters, and our 2 on 1 dive guide ratio ensures you can take all the time you want. Our custom-built boats are spacious and have everything you need – towels, emergency oxygen, coffee, snacks, and more. The bungalows are privately situated with amazing sea views. And each bungalow has it’s own deck/balcony. Rates start form as low as IDR 700.000 (*Euro 41, -), per person per night, full board. Delicious meals are served in our very comfortable restaurant/lounge with a stunning panorama view of the ocean on both sides and the magnificent Mount Klabat. We eat all together and friends are easily made at Divers Lodge Lembeh! Our experienced, English speaking dive guides will give you all the time you want, to discover and enjoy the famous “Critter Capitol of the World” at your own pace. They are happy to show you everything on your wish-list: mimic octopus, hairy frog fish, pygmy seahorses, specific nudibranches, harlequin shrimps, ghost pipe-fish, boxer crabs, flamboyant cuttlefish or others? They will find them if they are around. Every guide has made at least 400 dives in Lembeh Strait. If you want to get the most out of your diving holiday opt for a private boat with a private guide. You can plan your diving schedule as you wish, and discuss it with our on-site dive supervisor. Have a look at our very affordable rates here. Our boats are designed by divers and built for diving. They guarantee you comfortable and safe day-trips to all dive sites within the Strait of Lembeh and from October – May also to the Oceanside of Lembeh Island. We never take more than 6 divers/snorkelers on our most spacious boats and less on our other boats. We do not have a maximum dive time limit. As long it is safe and there are no deco-stops needed. Although we started diving in Lembeh Strait back in 2002, we still find new exciting sites. In the last 2 years we even discovered several top dive sites in the direct vicinity of the resort. Our “Mandarin House Reef” is one of the “must visit” places of the Strait. Self -guided dives from our beach cost only IDR 100.000, -/EUR* 6/USD* 7,40, per dive. 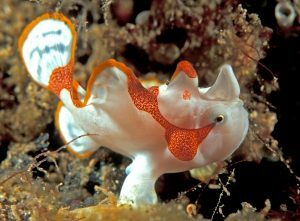 We don’t just offer excellent diving at Divers Lodge Lembeh. If you stay with us, you will enjoy the most beautiful part of Lembeh Island. The resort is a true butterfly paradise and over the years more and more birds made it their home. 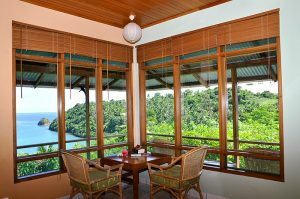 Divers Lodge Lembeh is surrounded by 25 hectares of tropical nature reserve. Tarsier Spectrum (very small primates), Civets and Monitor lizards are permanent residents here. We are also experts in organizing day trips to the most beautiful parts of North Sulawesi, including Tangkoko National Park and the Minahassa Highlands. The bungalows at Divers Lodge Lembeh – spaced well apart, with plenty of privacy, and each with their own private balcony – allows for spectacular sea views on both Lembeh Strait and Walenekoko Bay. Neat and spacious rooms with western style bathroom, excellent beds, hot shower and free laundry service, guarantee you a comfortable stay. The full-board accommodation price starts from as little as IDR 700.000/*EUR 41, -, per person, per night. Detailed descriptions of the bungalows can be found here. The kitchen of Divers Lodge Lembeh is keeping up her reputation of freshly prepared, tasty and healthy meals. The Indonesian dishes really taste Indonesian, without being too spicy. Instead of the traditional frying of the vegetables we also serve them steamed. There is extra home-made sambal for the guests who like it “very hot”. Pastas, potatoes and home-made bread are served to offer an alternative for rice and noodles. We do not use MSG and palm oil in our kitchen and all food is Halal. Of course we also cater for vegetarians and guests with other special dietary requirements. Smoking is not allowed in the restaurant and the lounge but one can smoke at the attached open air terrace. Have a look at our cuisine page to get a taste of our dishes. Free wireless internet is available (24h) at the restaurant & lounge area and there is a 42 inch full HDTV screen with DVD/Blu Ray player and movies (underwater and entertainment). We also provide music and a wide range of novels and marine life identification books. Booking your holidays with Divers Lodge Lembeh, Weda reef and rainforest Resort and Magic Bay Rao is easier than your daily shopping! No deposit, No cancellation fee. Pay when you Check Out. Or opt for a 10% discount by paying, all of a part, in advance. Just send an email to info@diverslodgelembeh.com or info@wedaresort.com. See our pricing page here. In general, money transfers, within European countries, can be made without any or very little costs. If you use the BIC code when transferring your (down) payment to our account in the Netherlands, there should not be an extra transfer fee. Transferring money from countries outside the E.U. sometimes is very expensive. In that case, we advise you to use your Credit Card to make an “off-line” money transfer, surcharge 2%. Finally, you can also pay through PayPal. We do have to charge 4.5% extra for this way of payment. Money transfers from within Indonesia and from some neighboring countries can be best made in IDR to our Indonesian IDR account. Please inform us in which currency and in which way you would like to make the payment and we will send you the proper bank details. At Divers Lodge Lembeh, you can pay additional costs by bank transfer, cash (EUR/USD/IDR) or by Credit Card (VISA and MasterCard). At our Weda Reef & Rainforest Resort you only can pay cash in EUR, USD or IDR and off-line Credit Card payment. For USD cash: preferably 100 USD notes, not older than 2009, without any marks, absolutely undamaged and unfolded, otherwise they will – for some strange reason – not be accepted by the local banks. Sampai jumpa (see you soon)! Below is a short movie made by Marcelo Johan Ogata during his time at Divers Lodge Lembeh. We thank him for this footage! Enjoy.